The Meizu M5 runs on Flyme 5.2.4.0 OS, which was built on top of an Android 6.0 Marshmallow core. Flyme, just like Apple's iOS, revolves around a single-tier UI - every app or widget resides directly on the homescreen without an additional app drawer that is typical for Android. All other system features can be configured through either the Settings menu or within the powerful Security app. In China, many Meizu models come with what they call Yun OS, which is a forked version of Android with China-exclusive services to replace everything Google's. This is the reason why Meizu is not a registered Google Services partner. So Meizu can't ship even their international models with the Google APIs and apps, which are must-haves in the Western markets. 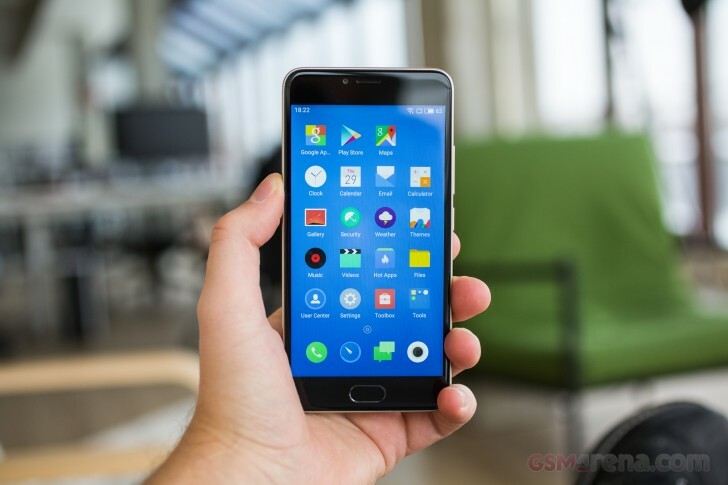 Meizu has found a workaround to give you those crucial apps - the Hot Apps application on your homescreen is a mini appstore of sorts and it would instantly recommend you downloading something called Google installer, which would add everything you need to enjoy a normal Android experience and would give you access to the Google Play store. Flyme offers a variety of customization options, including themes. There are lots of useful system-wide gestures, which you can use even when the screen is turned off. You have advanced features such as a Do-Not-Disturb mode and scheduled power on and off among others. Flyme 5 supports multi-view, which is managed via the task switching interface. The supported apps have a 'Multi' button, and you can activate a split-screen app right away. Unfortunately, the apps to support multi-view are only two - Video and Settings. Hopefully, this list will grow bigger with the upcoming firmware updates. Meizu provides all the necessary apps to get you started - gallery, multimedia players, calendar, weather, among other necessities, but you can find everything else in the Play Store. Meizu M5 is powered by the dated and mediocre MediaTek MT6750 chipset - that's a step below the Helio P10. It packs a true octa-core Cortex-A53 processor clocked at 1.5GHz. The GPU is nothing special - the Mali-T860 MP2 (read dual-core), and it is 2GB or 3GB of RAM. The same MT6750 chip is the one behind the Meizu m3, which makes little sense as the M5 is supposed to build on top of the m3. The processor performance is okay when Android operations are concerned, but it trails behind the competition once it comes to heavy duty tasks, which require all eight cores. The graphics performance hasn't changed a bit since the m3. It's worth nothing that the GPU at least supports the latest OpenGL ES 3.1. While the offscreen raw scores are nothing to talk about, the onscreen fps do improve because of the lower 720p resolution, and thus the M5 ends up better than the Redmi 4. Meizu M5 Note is powered by the Helio P10 chip, which has the same GPU but running on a higher frequency. You can see the performance gap between the M5 and the M5 Note in the BaseMark X test - when the GPU is that feeble, even the tiniest upgrades matter. Compound benchmarks such as AnTuTu and BaseMark OS II give us a better understanding of the overall performance. Here, the Meizu M5 stands better as the true-octa core processor and the lesser resolution give it an edge over some competitors. The benchmark tests show the Meizu M5 as an average performer, so it will provide an acceptable mid-ranger user experience, though we've expected a bit more. And the competition is ready to give us that extra bit of oomph at the same price. Unlike its Note sibling, the Meizu M5 failed to impress in either testing scenario. The smartphone had only decent volume level with an active external amplifier and fell well below average with headphones. The clarity was also excellent initially, but was rather disappointing with headphones. Frequency response, stereo quality and intermodultion distortion were all affected so this certainly won’t be an audiophile’s dream.